Your cat's pupils can reveal a lot about how she's currently feeling. When you're dealing with a cat that you suspect may be suffering in pain, the situation can be very frustrating. After all, the poor thing can't exactly speak up to tell you what's wrong. Thankfully, feline body language is often very telling -- just pay attention to the eyes and pupils. According to the American Animal Hospital Association, dilated pupils can indeed indicate pain. Look closely into your kitty's eyes. If the dark centers seem to be a lot wider than usual, the little one may be in a lot of discomfort at the moment. As soon as you suspect that your cat is in pain, set up an appointment with the veterinarian. Pain can be a warning sign for a lot of different feline health conditions, from arthritis to constipation. Pupil dilation doesn't necessarily mean that a cat is in pain, however. 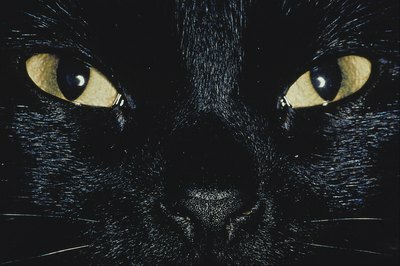 According to the Humane Society of the United States, partial pupil widening can also mean that a cat is feeling particularly anxious, frightened and on-edge. Maybe your fluff ball is a bundle of nerves because you just put her in the carrier and she thinks she's on her way to the veterinarian. Perhaps she's stressed out because you just brought a new and unfamiliar hyperactive puppy home for good -- and she doesn't like it one bit. At the other end of the spectrum from pain, full pupil dilation can also point to full-out aggression in a feline. If a cat is feeling threatened and protective, you may notice her pupils widening significantly. She may think that she's in the presence of a predator -- and she may also be ready to defend herself physically. Be very careful if you suspect that you're around a cat who is feeling hostile, and leave her alone immediately. The National Association of Professional Pet Sitters states that in some cases, dilated pupils also mean that a cat is feeling excited and ready to have some fun. Maybe she sees you holding her laser pointer or catnip-stuffed toy mouse and is ready for an energetic play session. Perhaps she's in a good mood because she's on her comfy window perch and all of the chirping neighborhood birds are out. Pupil dilation can indeed mean pain, although it can also be related to a bevy of other emotions and moods. However, if you are worried that your cutie's dilation is a symptom of pain, pay close attention to any other signs of distress. The American Animal Hospital Association cites various other key indicators that a cat is in pain, including antsy behavior, hiding away, persistent yowling, aggressiveness, exhaustion and fast heart rate. Always seek veterinary attention for your kitty if you think she may be hurting. Can Cats Die From Eating Poisoned Rats?